Acute lymphoblastic leukemia (ALL) is the most frequently diagnosed cancer in children and one of the leading causes of death due to disease in children. 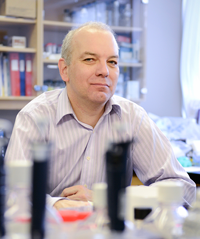 Dr. Daniel Sinnett, along with Pascal St-Onge and their colleagues at Sainte-Justine University Health center have been investigating the molecular determinants of the disease to improve detection, diagnosis and treatment. One particular area of study is precision cancer medicine. Specifically, the lab is seeking to find targeted therapies for patients who are not responding to their current treatments. Towards this goal, the lab is conducting whole exome sequencing and transcriptome analysis of matched tumor-normal samples. Their findings will then be reported to the molecular tumor board. The board proceeds to evaluate whether a particular patient could be a candidate for an approved Health Canada clinical trial or therapy given their genomic landscape. In 2017, the lab will join the efforts with other Quebec pediatric oncology centers to sequence childhood cancer cases both at diagnosis and at relapse. The Sinnett lab alone will run approximately 250 samples in a year’s time. Daniel Sinnett received his PhD in Biochemistry from the University of Montréal. There, his research focused on the genetic basis of several X-linked diseases, as well as on phenomena such as retroposition that influences complex genome structure and evolution. Sinnett then went to the Harvard Medical School in Boston for his postdoctoral training. He joined Marc Lalande’s group studying the genetic basis of Angelman Syndrome. Daniel Sinnett later established his molecular oncogenetics laboratory at the Sainte-Justine University Hospital. Here his group has made significant contributions in the understanding of genetic determinants of childhood leukemia in both the gene and the genomic levels. The significance of Professor Sinnett’s research has been acknowledged by becoming the first holder of a Research Chair in Pediatric Oncogenomics and by receiving a FRSQ national scientist scholar award. 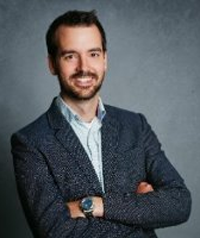 Dr. Sinnett is currently a Professor in the Departments of Pediatrics and Biochemistry at the University of Montreal, as well as a member of the Robert Cedergren Centre in Bioinformatics and Genomics. Pascal St-Onge received his undergraduate degree in Bioinformatics at the University of Montreal. Afterwards, St-Onge stayed on at the University of Montreal where he also earned his Masters of Science in Bioinformatics. Wanting to move closer to the clinical side of bioinformatics, Pascal joined the lab of Dr. Daniel Sinnett as a student. Since St-Onge has joined the lab he has moved from genotyping arrays to sequencing technologies, seeing the outcomes of research being used by clinicians. St-Onge is also a Ph. D. candidate in Computer Software Engineering. The Sainte-Justine University Hospital Centre is the largest mother-child center in Canada and one of the four largest pediatric centers in North America. Its 5,000 employees and 500 physicians, dentists and pharmacists work in a highly innovative environment, where knowledge is generated and shared daily and the patient and family are placed in the heart of the practice. Associated with the University of Montreal, CHU Sainte-Justine is by far the largest center for pediatric training in Quebec and a leader in Canada; every year it welcomes more than 4,000 students and trainees. The Research Centre of the CHU Sainte-Justine has more than 200 researchers. The hospital’s leadership is recognized, particularly in the areas of brain disorders, musculoskeletal diseases and movement sciences, the fetal-maternal and neonatal pathologies, metabolic health, viral diseases, cancer and immunity and progress to overall health. The Sainte-Justine University Hospital is the only medical facility dedicated exclusively to children, adolescents and mothers in Quebec.